Tim Rossovich (82) makes a tackle during the 1971 season. Tim Rossovich, a former Eagles linebacker and television actor, has died. He was 72. 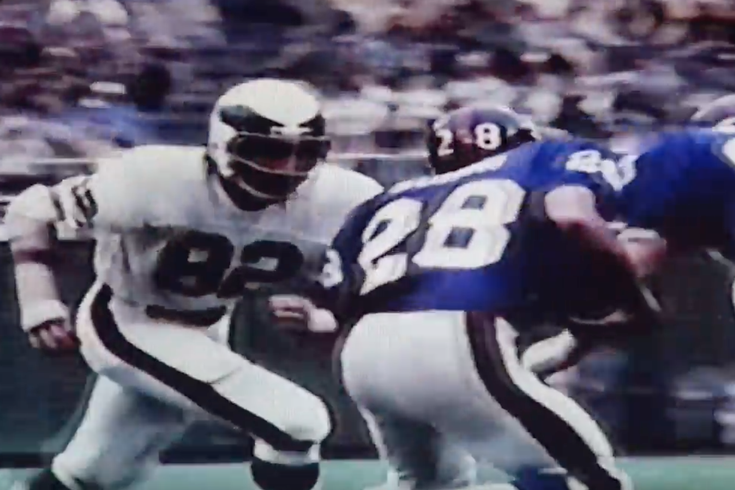 Rossovich was selected by the Eagles with the 14th pick of the 1968 NFL Draft and played for the team for four years. He was named to the Pro Bowl in his second season. Rossovich played for the Chargers for two seasons, spent two years with the World Football League’s Philadelphia Bell, and played a final season with the Houston Oilers in 1976 before retiring from football. After football, Rossovich was an actor and stuntman for more than 20 years. Rossovich appeared on MacGyver, The A-Team, Baywatch, Magnum P.I., and Knight Rider, among others. Rossovich, who played college football at USC and co-captained the team to a national championship in 1967, was inducted into the school’s Athletic Hall of Fame in 2015. Rossovich is survived by his wife Lauren and daughter Jaime.